UPGRADED 2018 VERSION Digital TV Antenna 60-90 Miles Range! Tired of high cable bill? With HotCat Antenna, enjoying Free Crystal Clear 1080p HD Channels. 1)Please visit www.antennapoint.com or antennaweb.org to check nearest radio towers around your. 2)Visit http://dtv.gov/maps to confirm available channels . 4)Connect tv antenna to 'Ant In' on the back of any HDTV. 5)Scan for channels using your TV's 'Channel Search' and be ready to enjoy free TV. Cable channels are not available using the antenna, like ESPN. Pls make sure your TV has HDTV Tuner, if not, kindly suggest you buy a digital converter box. Please remove the amplifier if your house is within 30 mile range from the tower. We do NOT Recommend to use this amplifier or booster if your house is very closer to the broadcast tower and have very strong signal . Check to make sure you have correctly connected the hd antenna to your HDTV or third-party HD receiver. Re-scan for channels: In the TV's setup menu, set the mode to hdtv antenna or air. Refer to the TV manual for detailed instructions. Try different locations, put the antenna up as high as you can. Or close to the window. 90 Day Full Refund and Lifetime Warranty with friendly customer service! 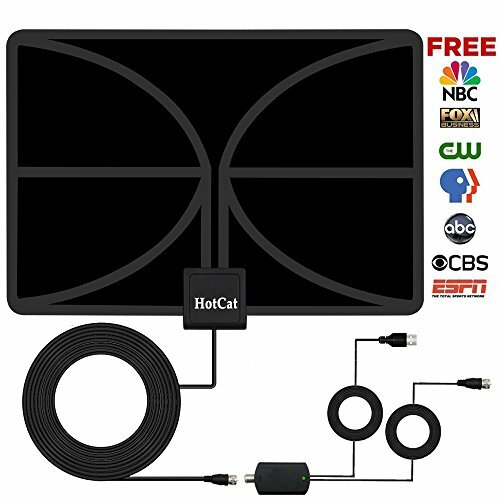 Now Choose HotCat Antenna and cut the cable, Enjoy FREE HD programs. 【Upgraded version of the amplifier】Anti-static anti-lightning，Use the amplifier for the antenna ,60-90 Miles signal reception range. The distance signal base station is less than 30 miles, please remove the amplifier, greater than 30 miles, use the amplifier.★IMPORTANT: This is an amplified TV antenna. If a signal cannot be received with the external amplifier, please adjust the signal amplifier and try. 【Thicker receiver panel (0.04 in) And thicker coaxial cable】So that the received signal is more powerful, search more channel , TV images are clearer, It'll pull in hundreds of crystal clear digital & HD shows! Two characteristics are different from other ordinary antenna on the market. 【What You Get?】Not only TV antenna with 16.6 ft THICKER coaxial cable, you also get new type 3.5ft amplifier ,3.5ft USB power supply, user manual, 3M stickers and a lot of fun for your family! If you have any questions about this product by HotCat, contact us by completing and submitting the form below. If you are looking for a specif part number, please include it with your message.